DogTime and CatTime are thrilled to support Nebraska Humane Society, recipient of a DogTime Media donation as chosen by Petties winner Lorie Huston. We are the 5th oldest Humane Society in the country! Our organization started in 1875 as a refuge for both abandoned animals and orphaned children. Once the government took over the care of homeless children in the early 1900’s (basically the inception of Health and Human Services) our shelter became the provider for animals. Our mission statement is to “provide a voice for the animals and through them enrich the communities we serve.” We rescue, rehabilitate and rehome companion animals in Omaha, Nebraska and the surrounding area. We provide animal control services to Omaha and Sarpy County and are an open entry shelter that takes in strays, owner surrendered animals, and those rescued from cruelty and neglect situations. We assess them for adoptability based on health and temperament and work to rehabilitate and rehome all possible. We utilize our own veterinarians, community vets, volunteer foster homes and rescues, volunteer trainers, and of course, adopters toward this end. This past spring we had a house fire which severely injured one of the children and also badly singed the feet, legs and whiskers of the family’s two -month-old kitten, Jacob. The family was overwhelmed with the loss of the house and the medical needs of the child and turned the kitten over to the shelter for care and rehoming, deciding that when the time was right, down the road, they would adopt another kitten. 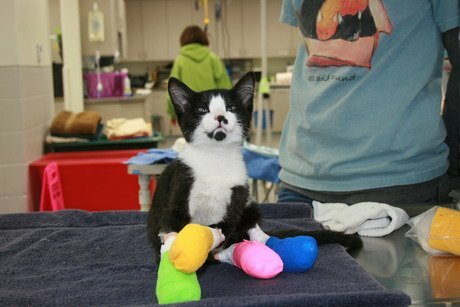 Jacob was an upbeat little cat even though he was injured and uncomfortable. He was very good about the warm water baths of his feet to shed the dying skin, and twice-a-day bandage changes. Everyone at the shelter fell in love with him, but the police officer who first found him after the fire had shown interest in adopting him. When he was ready, she adopted him for her young son. He now lives with his older “brother” Siamese cat, and a human brother too. Inspired by the work of Nebraska Humane? Consider making a donation to their organization.